You've heard me talking about it all winter: Stopping and noticing all the beautiful right nows, turning our senses up enough to see the sights and smells and tastes that make up our lives, slowing the spinning to see the Divine in every moment. I began my own journey into gratitude at the beginning of the year, starting a new kind of list void of all the usual things: endless lists of what I need to do and emails I need to send and errands I need to run; a new kind of list counting the simple, yet sacred that I almost rushed right past. I am not good at slow. I have always proudly donned the "multi-tasker" label and thrived on productivity and efficiency. In many ways, it feels more natural to rush and spin and flurry my way toward a checked-off to do list. It's easier to do than to stop and be. But the longer I journey down this road of gratitude, this road of slowing and seeing, the more I am convinced that this is the way life is meant to be lived. Brene Brown says is her book, Daring Greatly, "Joy comes to us in moments - ordinary moments. 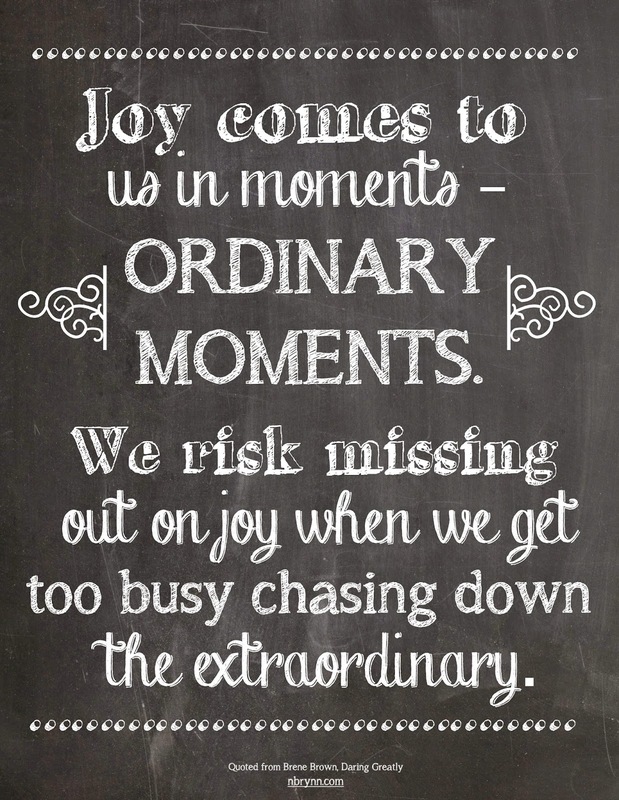 We risk missing out on joy when we get too busy chasing down the extraordinary." I have spent a lot of my life, and still spend too many days, chasing some future goal, chasing the next big thing, the next family event, the next checked box. All the while, I know that right now is all I need. I was convinced of this further after listening to a beautiful talk about seeing the depth and the Divine in everything and every moment. "For many people, life is moving so fast, they are merely skimming across the surface, missing the Divine Presence in all of life....It's a meal, but it's just a meal. It's a job, but it's just a job. It's a conversation, but it's just a conversation. Everything exists cut off from depth, cut off from the endless Essence that is present in everything..." says Rob Bell, in his podcast Receipts. I so relate to this. To this way of rushing and missing, of spinning and barely noticing what is right in front of me. The soul that is looking me in the eye from across the cash register, the hands that are literally like no other holding the door for me, the voice that is honoring me with, "Mama, mama, I need you!" I miss so much, so often. But sometimes, I see. Like when messes turn into meaning. Or when bedtime conversations turn into holy portals. If, in gratitude, I am counting the ways, I am more likely to see those hands for the Divine fingerprints they are and those whines for the Divine whispers they are. If I am counting, I am so much more likely to see. And Bell says, "The art, the task, the challenge, the invitation of the spiritual life is for you to see the depths of your own life. 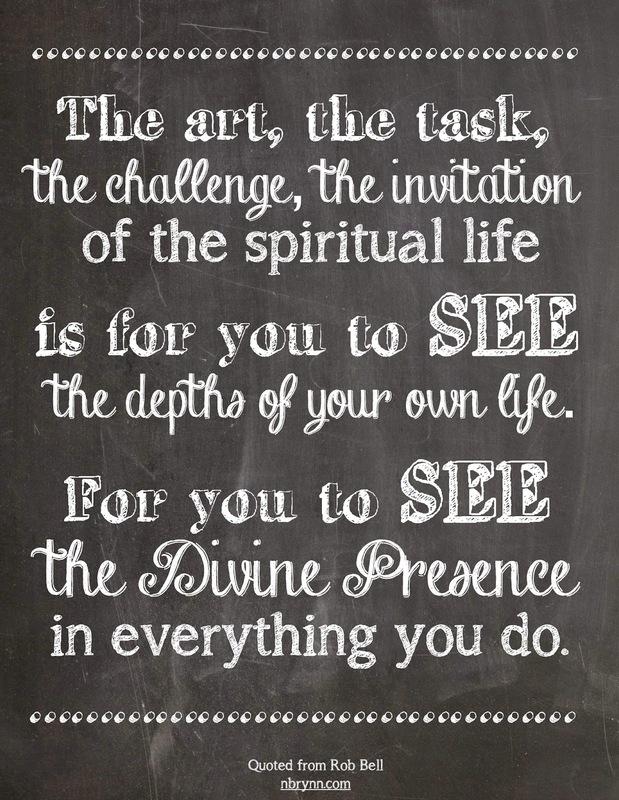 For you to see the Divine Presence in everything you do. This is where the action is: Learning to see." I long to be a see-er, to be someone whose breath is taken away just by looking around the kitchen table and realizing what unique and miraculous life is surrounding me. Someone who regularly takes note of all the good and beautiful right in front of me - no matter how "hidden" it may seem. 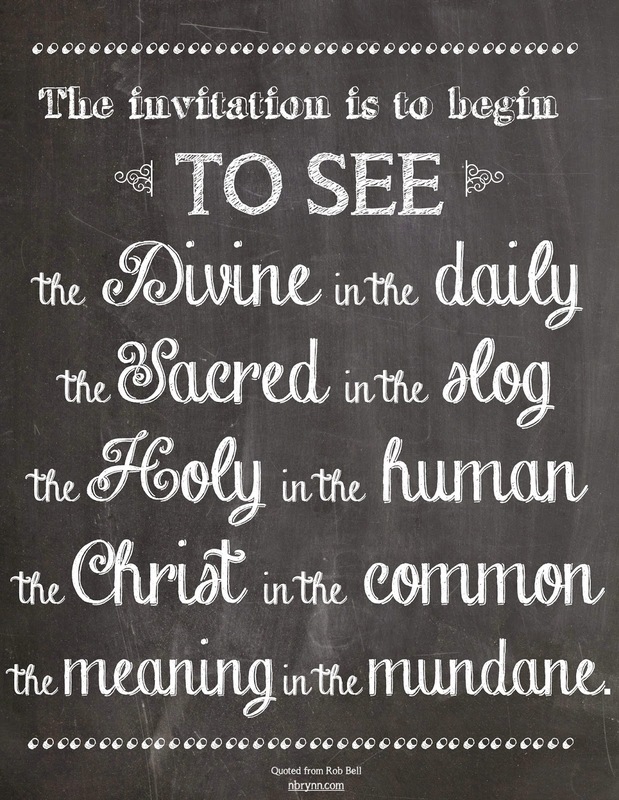 Bell concludes his podcast with this, "The invitation is to begin to see the Divine in the daily, the Sacred in the slog, the Holy in the human, the Christ in the common. Most of us are cut off from the meaning in the mundane." Today, may we see a bit more Sacred, a bit more Holy, a bit more Divine in our day.